Join the Harvard Club of Delaware for a stimulating evening with Professor Donna Hicks, who will be speaking on dignity, leadership, and conflict resolution. Dr. Donna Hicks is an Associate at the Weatherhead Center for International Affairs, Harvard University. She worked extensively on the Israeli/Palestinian conflict and as a member of the third party in numerous unofficial diplomatic efforts. In addition to her work in the Middle East, She has also worked on the conflicts in Northern Ireland and Colombia and conducted several US/Cuba dialogues. She is the Vice President of Ara Pacis, an Italian non-governmental organization based in Rome. They are currently involved in a dignity restoration project in Syria and Libya. Dr. Hicks has taught courses in conflict resolution at Harvard, Clark, and Columbia Universities and conducts trainings and educational seminars in the US and abroad on the role dignity plays in healing and reconciling relationships in conflict as well as dignity leadership training. She is the author of the book, Dignity: It’s Essential Role in Resolving Conflict, published in 2011 by Yale University Press. 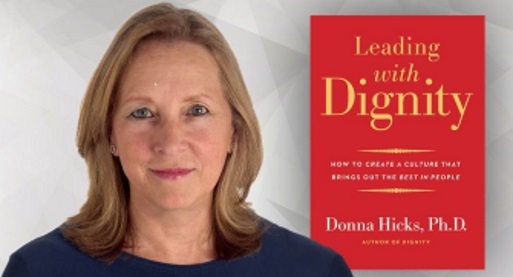 Her second book, Leading with Dignity: How to Create a Culture That Brings Out the Best in People, was published by Yale University Press in August 2018. RSVP through the Harvard Club of Delaware's website by clicking here.